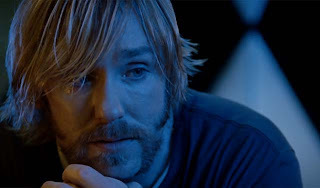 Fourth Row Center: Film Writings by Jason Bailey: In Theaters: "Roadie"
Ron Eldard stars; here’s an actor who was up to some interesting things in the mid-‘90s, and then just kind of dropped off the radar. He plays Jimmy Testagross, who has spent the better part of his life as a roadie for Blue Oyster Cult, and he certainly looks the part—he’s a little rounder than we might remember, with rocker facial hair and shades a few years past style. When the story starts, Jimmy’s got some bad news—the band’s not taking him on their next tour. With nowhere to go, he ends up visiting his mother in Queens, where he grew up; soon he’s reconnected with his high school girlfriend (Jill Hennessy) and her husband (Bobby Canavale), who was not exactly Jimmy’s booster in those days. There is probably a great movie character to be found in the aging roadie, and the script (by Gerald and Michael Cuesta) hints at it; there’s a good scene early on where he lies to his mother about what he does, saying he’s the band’s manager and a songwriter/producer for them. He says it just to make her proud, but when she says she is, it triggers a flicker of guilt in him. That’s about as complex as the storytelling gets, though. Once Jimmy has landed in Queens, the Cuestas can’t come up with much more to do with him than shuffle him around and have the characters mumble at each other. Canavale in an endlessly interesting actor, one who can always be counted on to give a picture a shot of adrenaline, but even he eventually buckles under all the blandness; Hennessy does the best she can, but hers is a nothing part that disappears before your eyes. After they reunite, Jimmy brings her back to his house, and there is a long scene of her making coffee that just about puts the audience to sleep. I suppose we’re meant to be drawn into the subtext, into what’s happening between them, but there’s the rub: nothing’s happening. Most of the dialogue amounts to reminiscing and exposition; there’s no wit to it. It’s all just small talk, and after a while, we’ve tuned it out. Eldard is also problematic—he has moments that are right on, but there’s no control to the performance. There’s a scene where he frantically goes into his bathroom, nervous about the old girlfriend sitting on his bed, and the Cuesta lets him get away with some silent movie acting—big, broad mugging, all indication. Later, he goes to a hotel room with Hennessy and Canavale to get high and hammered before she plays a gig—a scene that is about as much fun to sit and watch on screen as it is in real life—and getting coked up gives him an excuse to get all twitchy. Plus, Canavale is just a more compelling actor; as Hennessy and Eldard go back and forth in that scene, the most interesting thing in it is the way Canavale’s eyes keep darting between them. That scene, of course, concludes with all of the expected confrontations and blow-ups; he then heads home to his mother for the required crying/yelling “Dad smashed my guitar!” monologue (which actually includes the line “I was good, Ma! I coulda been great!” Paging Terry Malloy…), followed by the most painfully literal closing scene in recent memory. It’s all directed in a TV-movie style, unimaginative coverage (two-shot, rotating close-ups, etc.) shot at a dragging pace. Roadie is aimless and dull, and then it’s over. You’ve been warned. "Roadie" opens tomorrow in limited release.